When you’re looking to create a look from the 1970s it can be easy to fall back on stereotypical items. However, when you’re creating vintage items from original patterns, you want your outfit to say ‘fashion’ rather than ‘fancy dress’. 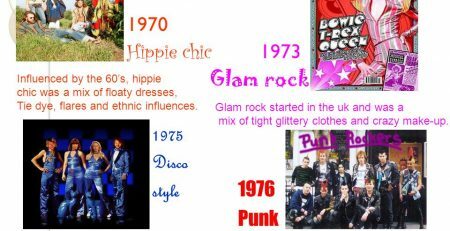 Today we’re going to look at some style ideas that include classic outfits from the ‘70s that will still fit well with modern life. The comfort of staple blue jeans was born in the 1970s, and you would see them everywhere on everyone. Whether at home or at the office, they were often worn with simple tops such as snug knits or polo shirts with large collars. Pair with long tunic tops for an early ‘70s vibe, or with loose peasant tops for more of a late ‘70s look. The key features of jeans from this decade were a high and tight waist, with a wide leg that flared out. Whilst the bell-bottoms are the most recognisable style for this period, often straight leg or smaller flared legs were the most commonly worn. Currently jumpsuits are seeing a resurgence, so it’s the perfect time to create yours from our vintage pattern collection. These are stand-out items and so tended to be reserved for nights out dancing and socialising. Jumpsuits were the go-to item to make an entrance at any party. Again, like other trouser items of clothing, they were wide legged or bell-shaped. There was no hiding away in a one-piece like these, so they were often in bright colours or bold prints. In the 1970s, wrap dresses were usually made from a light jersey fabric. This type of material helps it cling to the body in the right places, whilst giving a loose flowing bottom section. They would come with a thin tie belt that would often be quite loose. Most wrap dresses were worn knee-length, offering a style that could take you from day to night. They were easy to throw on, offering a casual look that exuded femininity. Like the jumpsuit, maxi dresses can’t help but make an impact. An iconic item from the ‘70s, they could be seen as vintage-inspired at the time, having taken inspiration from Edwardian ruffles, puffy sleeves, and an empire waistband. Maxi dresses usually featured different patterns, whether floral prints and pastels, or more bohemian prints. For more advice and information on vintage patterns from the 1970s, please complete the online contact form, or email us at thevintagepatternshop@yahoo.com. You can also speak to us directly by calling either (0044) 1621-331441 or (0044) 7595261171. A member of the team will be pleased to assist you with any queries you may have for us.